Students and teachers alike often complain about the challenges of English spelling, given the myriad rules which seem to break other rules, which break other rules. There does not seem to be much consistency between how words are pronounced and how they are spelled. One sound can be spelled three, four or five different ways. In this informative session, we establish that there are actually patterns in English spelling, many of which are rooted in the history of the language. 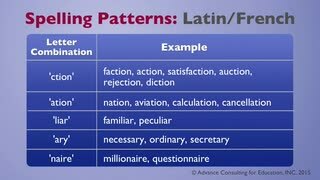 We will look at these patterns in detail as a foundation for helping to understand the rules of English spelling. We will then look at a variety of teaching strategies and activities that you can use to effectively teach spelling to your students. 1. Why is Spelling Important?